Buy Clublaptop CLCP1001 Cooling Pad (Silver) online - Clublaptop - The largest online store by Manufacturer of Laptop Accessories and Spares. Increase your laptop's performance and life with our exciting range of Laptop Cooling Pads. Superior air flow technology, absolutely noise free operation and sleek ergonomic design makes it a perfect addon to your laptop. Now work for longer hours without laptop overheating. Cool Looks Cooler Performance. 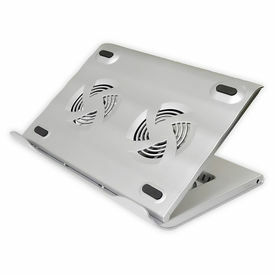 Increase your laptop's performance and life with Clublaptop Cooling pad. > Support laptops with screen size 13"